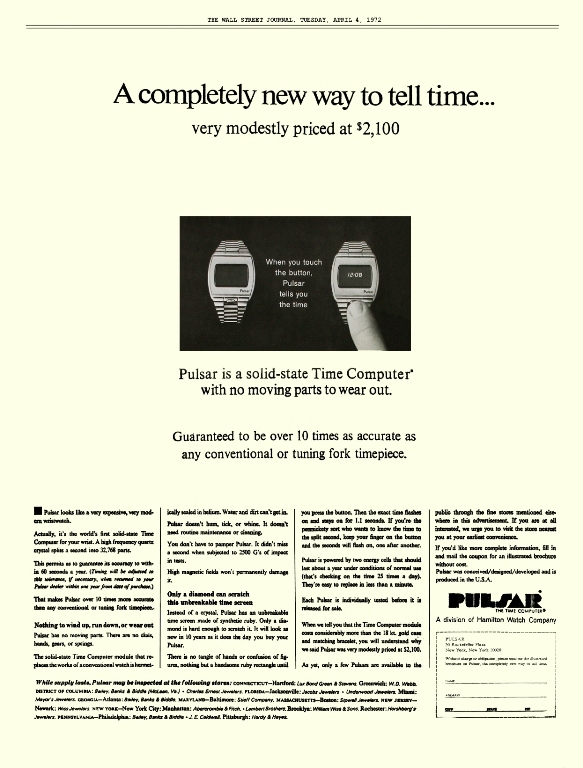 "The Worlds First LED Digital Watch"
Forty years ago, on April 4th, the way the world would tell time, changed. In the (above) full-page newspaper advertisement showcasing the newest way to tell time in 500 years, was the Pulsar. For many, this was the first time they had seen such a watch. 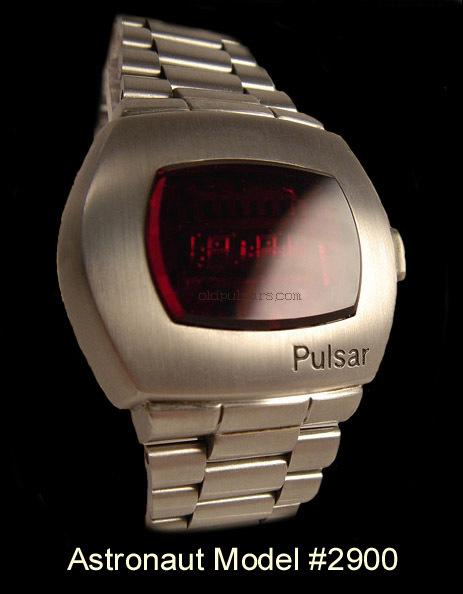 The Pulsar and it's digital LED display was first introduced in May of 1970 but over the next 23 months, little new information was available. Then, after the long wait, came the production release -- but at a price 40% more than the original projected price. I think it would be safe to say that the Wall Street Journal was the best newspaper to advertise such a "Modestly Priced" watch. At $2,100, only the wealthy could afford the Limited Edition Pulsar. With only 450 watches available and an allocation to the dealer network, just a fraction of the so called "one-percenters" on Wall Street had a chance to find one locally. Enthusiasts could mail in for the free Brochure that was included in the Press Kit available to major news networks across the nation. 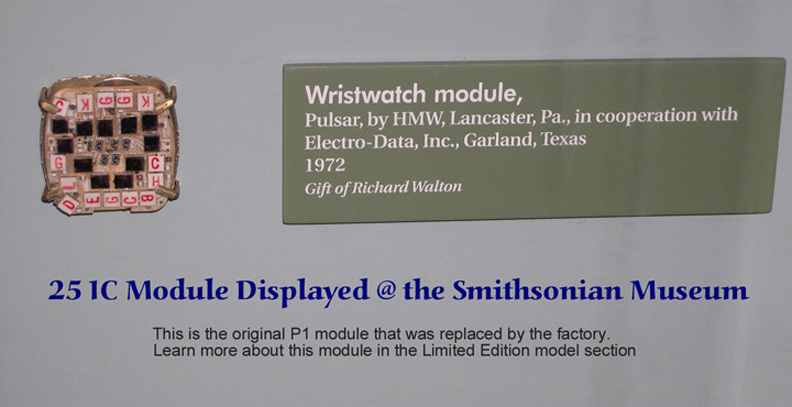 The Hamilton/Pulsar was the first LED solid state digital watch . It is well documented in history through the US Patent office and the Smithsonian Institution. 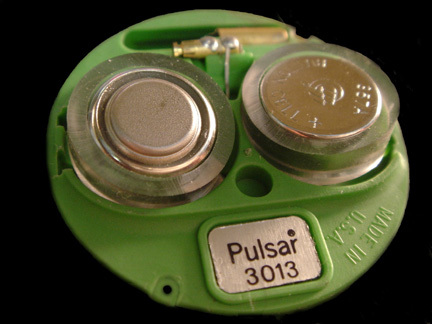 I also need to mention that the Seiko Watch Co. of Japan purchased the Pulsar name and owns all legal rights to the name. Any mention of the Pulsar name in reference to watches on this website is solely in respect to the old original Pulsar LED watches that were manufactured by Time Computer, Inc. before name was sold. 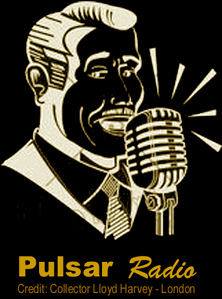 Commercial #4 . . . It's about time! Pulsar in the Movies "Bond........ James Bond"
Pulsar in the Smithsonian . . . One of the most prestigious awards for an invention is for it to be displayed in the Museum at the Smithsonian Institute in Washington DC. Imagine how many watches there are in the world, then realize there are only a few wristwatches on display at the museum. One needs to consider how important this watch is in the Horology category. Somebody out there would have a hard time convincing me that any other wristwatch has had the impact that the First LED Digital Watch has had on this planet. Invented over 35 years ago, it still has the mystique, charm, and well.....still the coolest damn watch there is! You have to ask yourself....out of all the watches sold today, what percentage are Digital? On the technical side, the first electronic module had 25 ICs (Integrated Chips) and was completely transistorized with no "moving parts". That in conjunction with the LED digital display (which seemed to hypnotize people) started the digital frenzy. Everybody wanted one but only the fortunate could afford it. 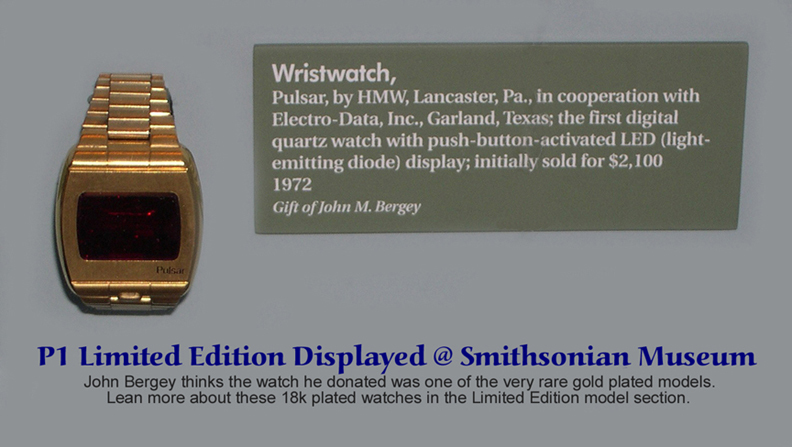 This watch had such a tremendous impact it just could not go unnoticed by the museum. 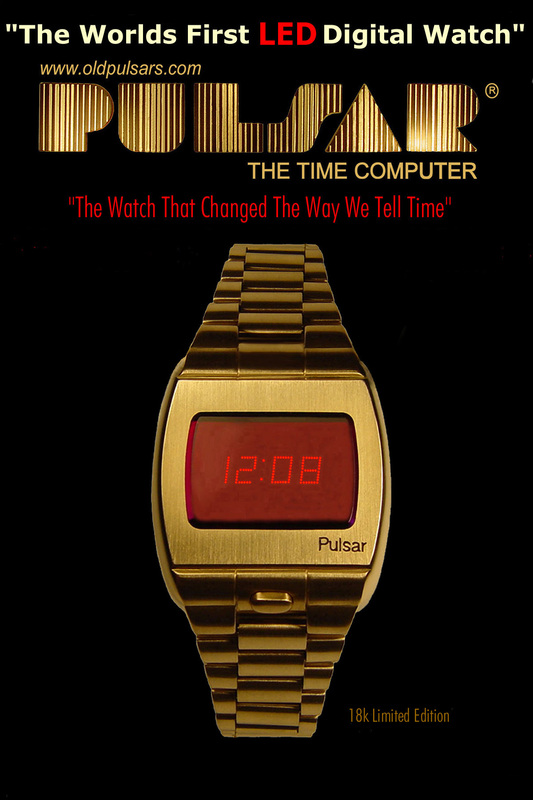 This truly is the watch that "Changed the Way We Tell Time". When John M. Bergey and Richard S. Walton donated these items to the Museum they built a display for the whole world to see. Thanks to a collector friend, those that can't go to the Smithsonian can get a glimpse. You'll find more information on the Limited Edition by clicking on the Models button on the navigator (controller) and going to the Model 2800 or Limited Edition. Pulsar on the Antiques Roadshow . . . One of the world's top LED watch collectors takes his collection to London for one of the biggest Roadshow events ever. 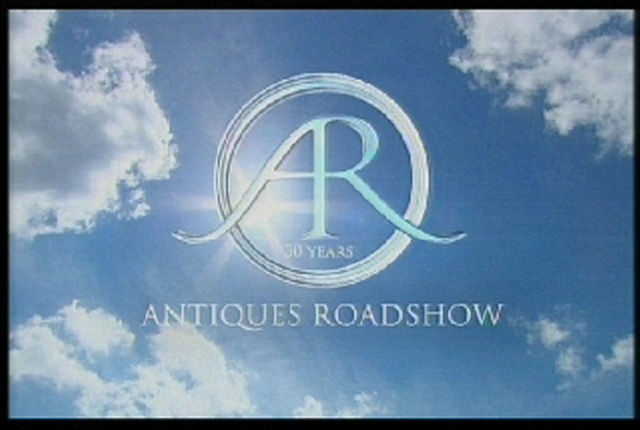 Celebrating 30 years, Antiques Roadshow goes back to the 70's, when the show began. 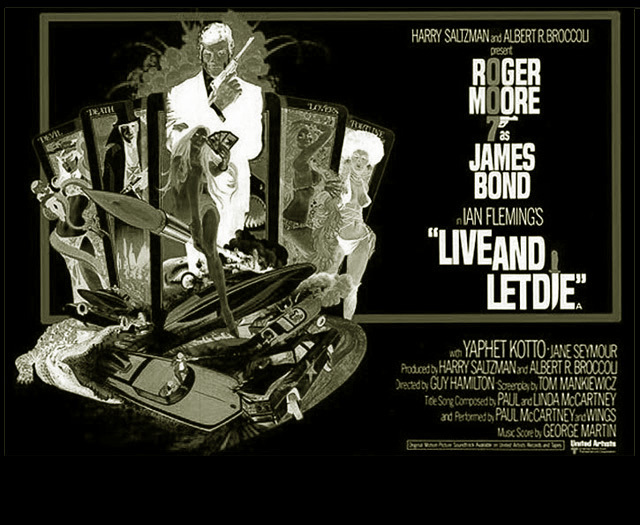 The show's theme was investments made in 70's collectables. With a watch that originally sold for $2.100 in 1972, then nearly $18,000 almost 35 years later, the Pulsar Limited Edition certainly fits the billing! This fantastic 5 min. 37 sec. video gives Pulsar and other LED watches the recognition they deserve . . . Great job Lloyd! 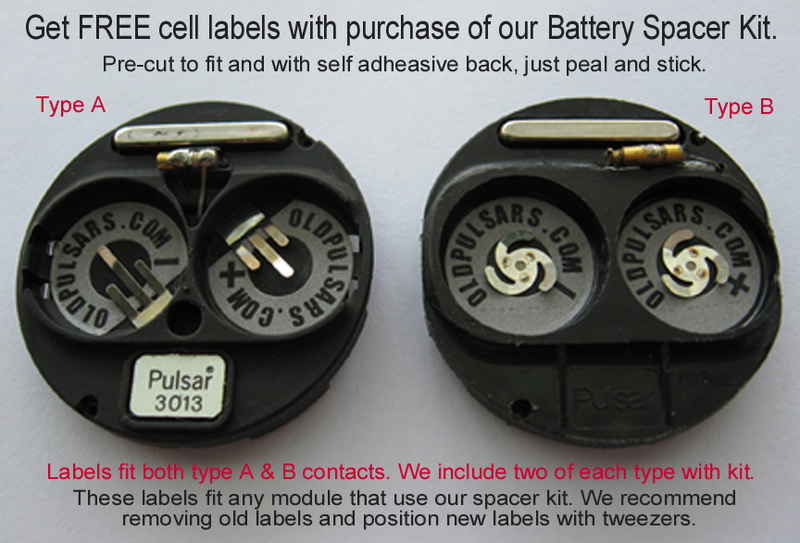 You get (2) two 357/303 Silver Oxide batteries and (2) two spacers to fit the older Pulsars like the P1 model 2800, All P2 one Button models, All P2-Date II & P3 Date-Command models (Please check the "Models" section to verify your model ). 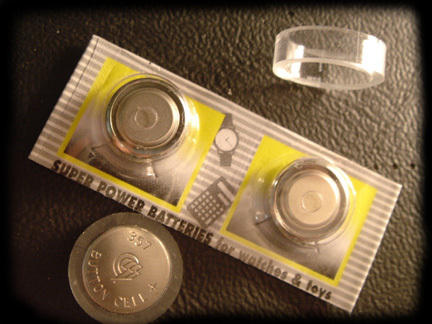 These can also be used for the Omega TC-1, TC-2 & TC-3 models as well as the Hamilton QED one and two button models that used the Time Computer, Inc. modules. These batteries & spacers will replace the discontinued #355 batteries that were originally used in these models. Shipping outside of the USA is an additional $1.00 for a total of $13.00 for those outside the USA ................... Please see payment details below.
. . . . . PLEASE . . . . . You Must notify me of payment! . . . . . . If you don't notify me of payment I will not know the funds are there as PayPal does not always send me notification. Copyright......All information and pictures on this website are the property of oldpulsars.com and are protected under the copyright laws. No information or pictures shall be copied, printed or used for any purpose without the written consent of the webmaster.